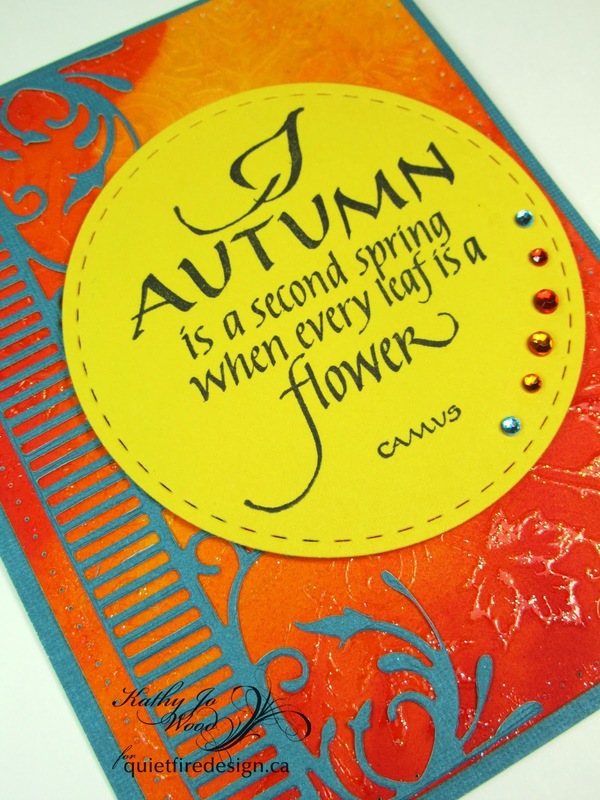 Yes, fall is starting here in Nova Scotia and I can't help but think of this quote as I walk through the woods. Many of the trees are starting to change color and I often stop to admire the beautiful leaves on display. Such a lovely time of year! The paper was die cut using Elizabeth Craft Designs' Stitched Rectangles die and mounted on turquoise card stock. 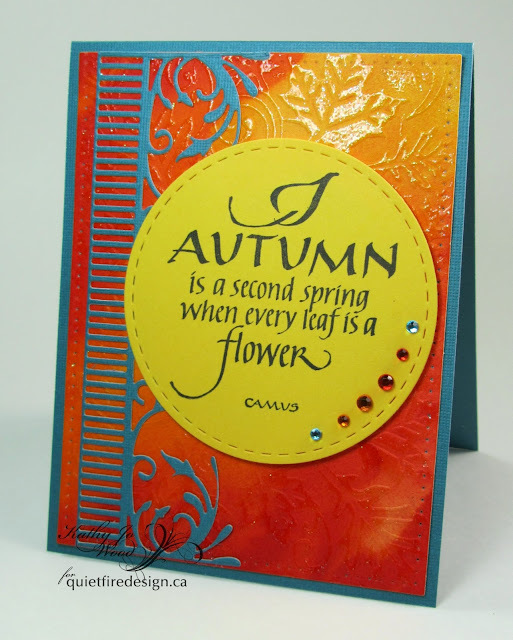 The card stock was also die cut using Cheery Lynn's valence die and mounted as shown. 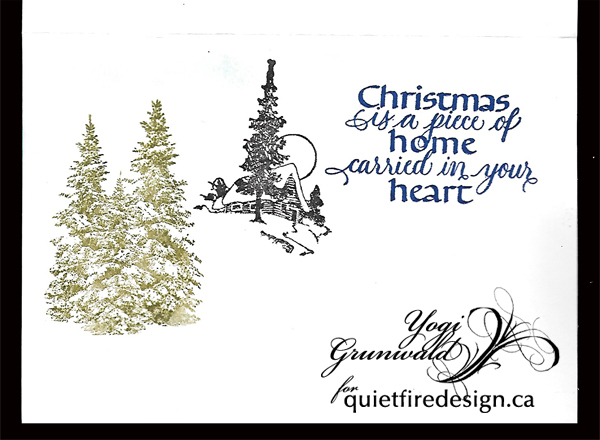 Yellow card stock was stamped using the Quietfire Design stamp in Archival Ink (Jet Black). 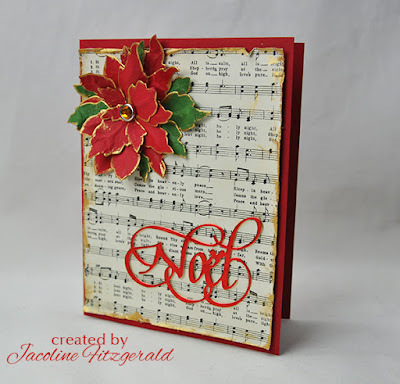 It was die cut using Elizabeth Craft Designs' Stitched Circle die and then foam mounted. The finishing touch was 6 wee matching gems. Thanks so much for stopping by! I do hope you enjoyed the bright, autumn card! Hello, Connie Nichol here today with an autumn themed scrapbook layout featuring two of the Way with Words dies and a beautiful stamp about raising our children from Quietfire Design. 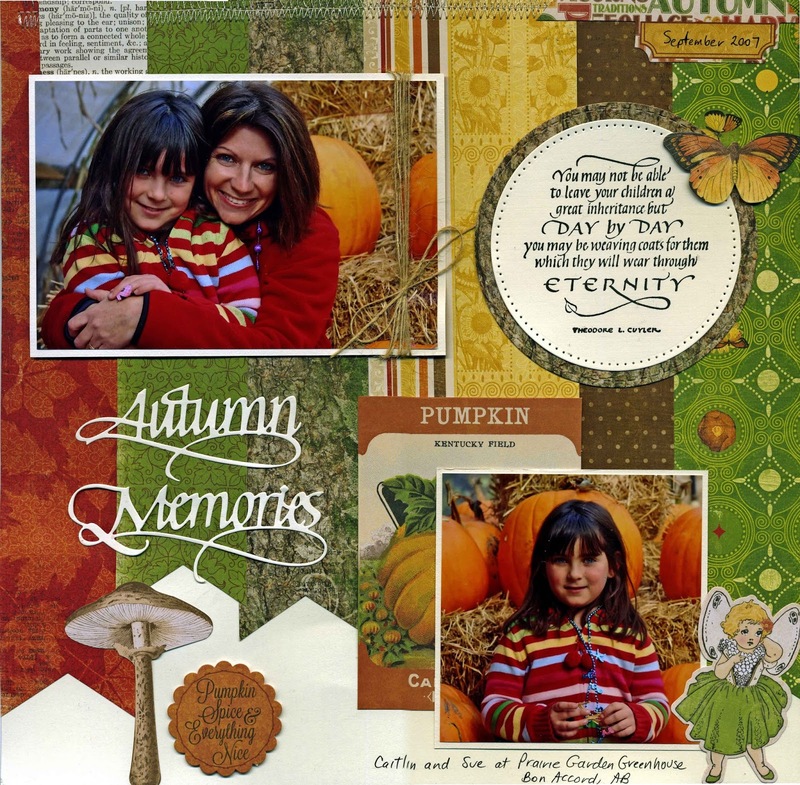 The photos in this layout are of my friend Sue and her beautiful daughter from 11 years ago. We used to take our children on all sorts of little adventures, and although the kids don't remember any of them now, the stamped quote is totally true. All the things we do with and for our kids add up to help shape who they become. Go make some memories with your family. And takes lots of pictures! Supplies Used: Bo Bunny patterned paper and die cuts, Stampin Up cardstock and banner edge punch, Clearsnap Ink, Quietfire Design stamp, Elizabeth Craft Designs dies, Scrapbook Adhesive by 3L foam adhesive, Brother sewing machine, May Arts ribbon. 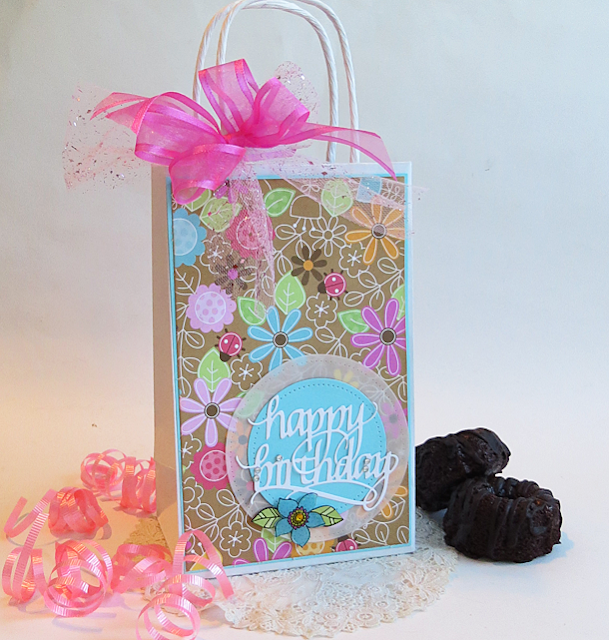 I don't know about everyone else but I always seem to need Birthday cards and bags for my friends and family so what better die to share today than the new Happy Birthday die set. I grabbed some fun papers and goodies out of my stash for this one and set to work to make something fun and bright to give some pretty things and a gift card i bought for my friends birthday this week. paper. Then i cut another piece of printed flower paper just a bit smaller and glued all of it to the front of the bag to dry. For the Happy Birthday medallion i cut the letters in white card stock and set them aside and then cut 2 circles using a metal die. One in white vellum and the other in the same turquoise that i did the first mat in. 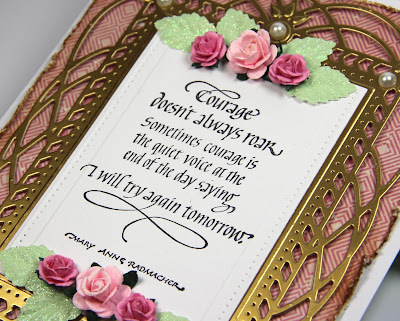 I glued all of them together with adhesive and then added a few rhinestones, the sentiment and a pretty adhesive flower on the bottom that i had in my stash to match. And finally to finish it i tied some pretty ribbons to the handle on the top and it's ready to stuff with a wonderful gift for my friend. Here is a closeup so that you can see the die better. I really love the swirls on this one and how pretty that they overlap on each other. And here is the link to the store just in case you need to add this beauty to your shopping list "Happy Birthday Die".... Have a wonderful and creative day!! 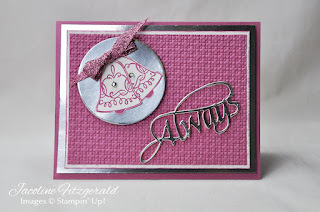 A Way With Words kisses Stampin' Up! My friend Jacoline Fitzgerald knew what a panic I was in as I prepared for the Great Canadian Scrapbook Carnival in Edmonton earlier this month! She had purchased the Buy It All complete set of A Way With Words dies, so she was ready to create and lend a much-needed and unexpected helping hand. What a sweetheart! I wanted to share her beautiful cards with you. 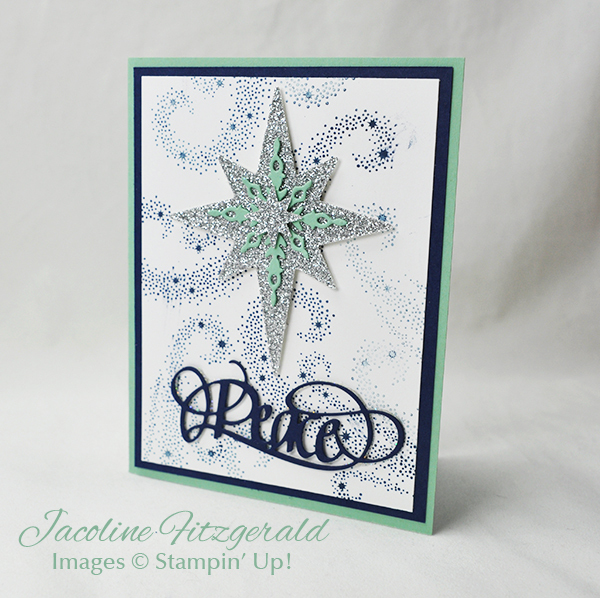 Jacoline is a Stampin' Up! demonstrator who doesn't mind stepping out every once in a while - and boy, am I glad she does. 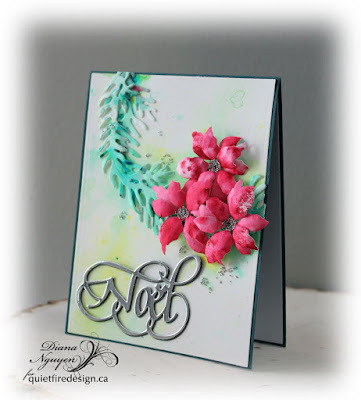 All products used in these cards are Stampin' Up!, except for the A Way With Words dies, of course, and the poinsettia on the Noel card which is Susan Tierney-Cockburn's Garden Notes Poinsettia available from Elizabeth Craft Designs. Just click on each card to see it larger! Thank you so much Jacoline! Labels: A Way With Words, always, Cozy, Jacoline Fitzgerald, Let it Snow, Noel, Peace, Stampin' Up! Good Morning. 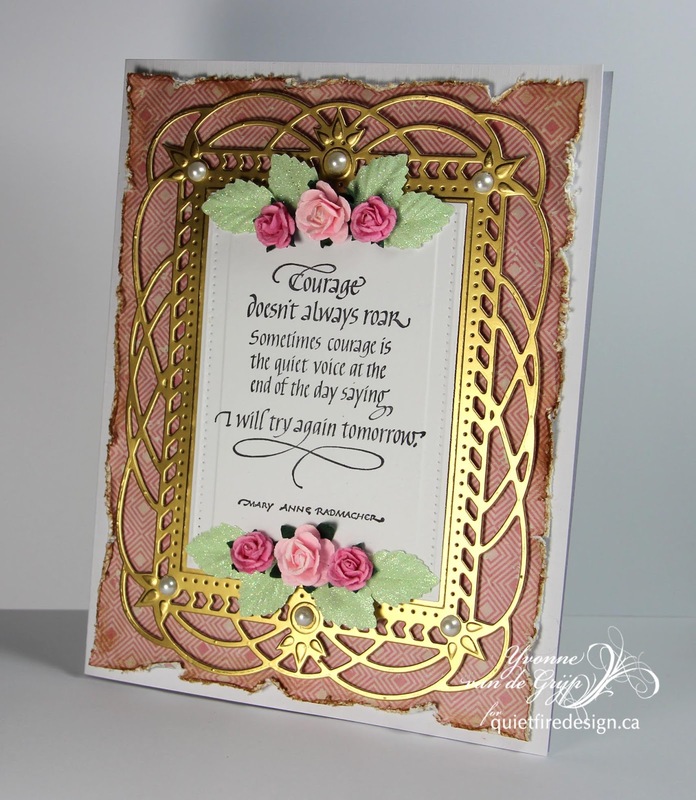 This is Selma today and I have a card with Suzanne's beautiful A Way With Words - Cherish die cut. Isn't that a beautiful sentiment! To give dimension to the sentiment, Cherish was die cut four times and all four die cuts glued together. By doing this, it really makes the sentiment "pop". This is a 6x6 inch card. A piece of ScrapBerry's Happily Ever After design paper was used for the background. 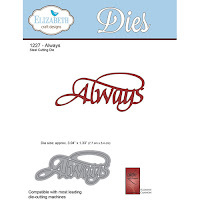 Els van de Burgt Entwined Oval was die cut and centered at the top of the card. Cherish was glued in the center. 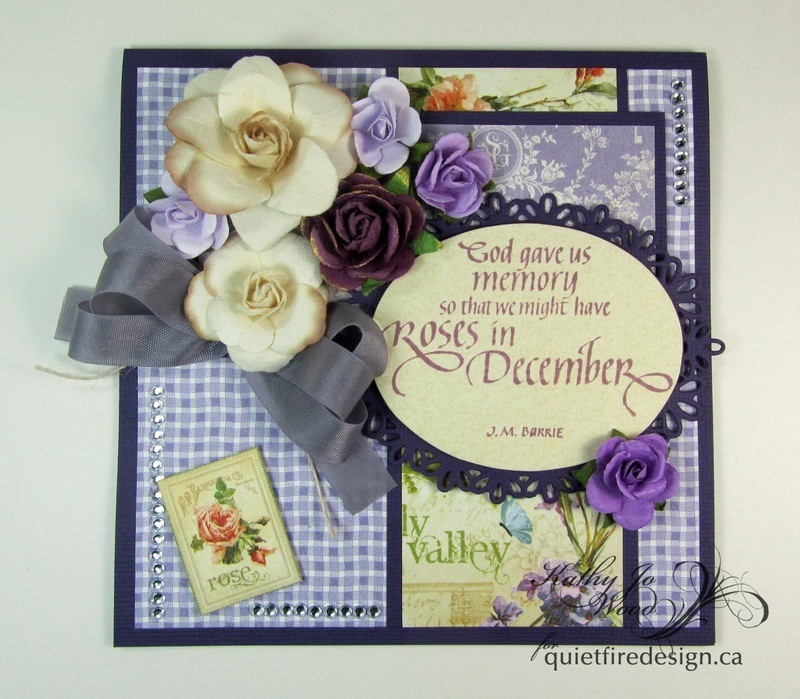 In keeping with the flowers in the design paper, I used Susan's Garden Notes Peony and Garden Notes Hydrangea die sets to create matching flowers. 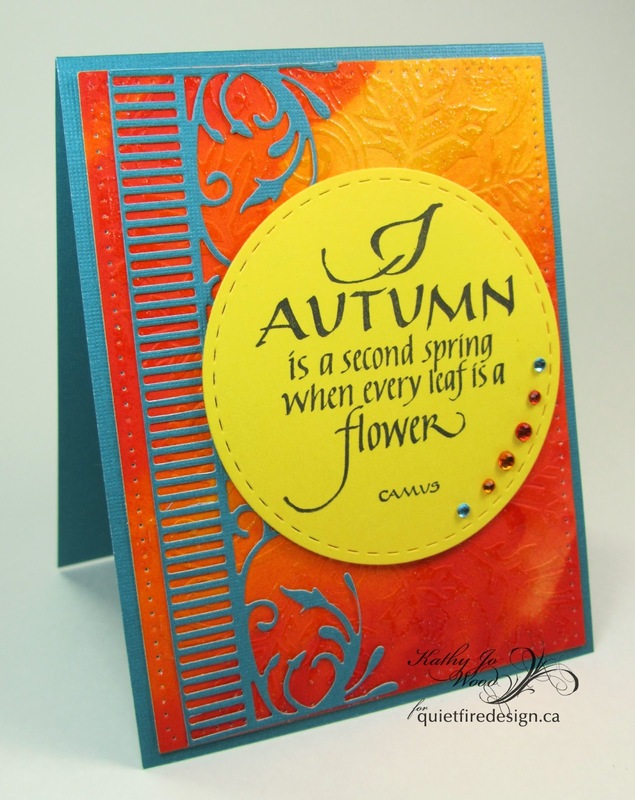 At the top of the card two Corners 1 die cuts were added. 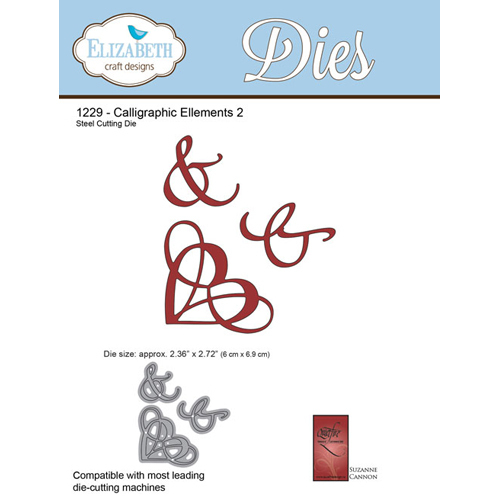 These dies sets are available from Elizabeth Craft Designs. To complete the card, a few pearls were added. 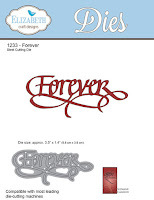 Be sure to check out all 55, A Way With Word, die sets at this LINK. 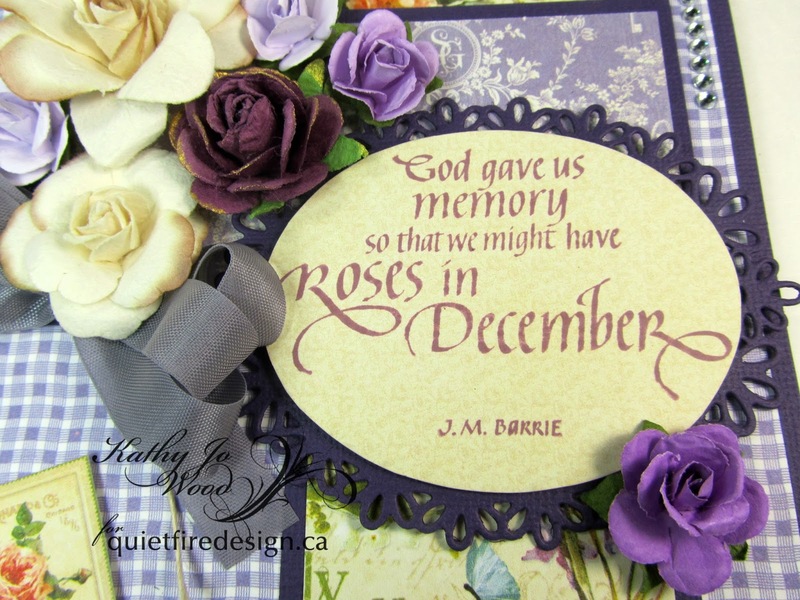 I am sure you will be excited about all the beautiful sentiments you can die cut for your projects. 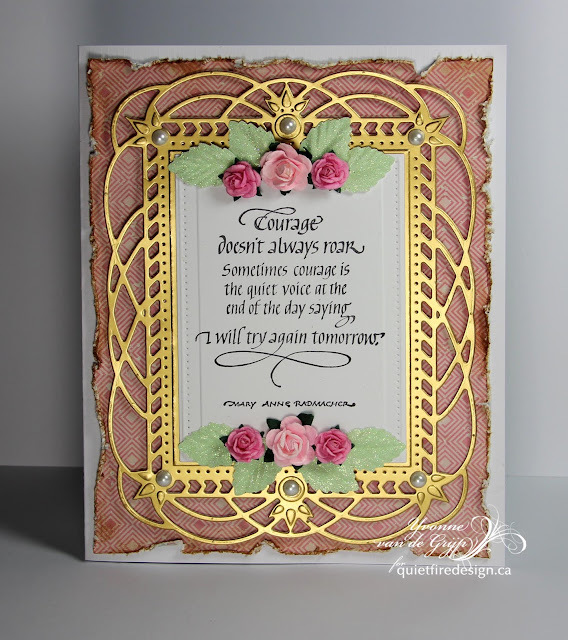 Yvonne here sharing a card made with the Quietfire Design companion stampset "Courage doesn't Always roar". 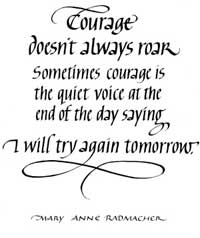 A great quote saying that courage makes you not giving up....so true! 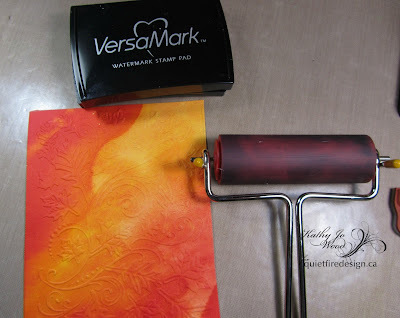 By altering the edged of the patterend paper and add a little brown ink (with the ink blending tool) you get that lovely worn look. Thanks so much for stopping by and wishing you a lovelyday. Yogi here today with a very quick and easy CAS card... using an alcohol ink snowy sky background. 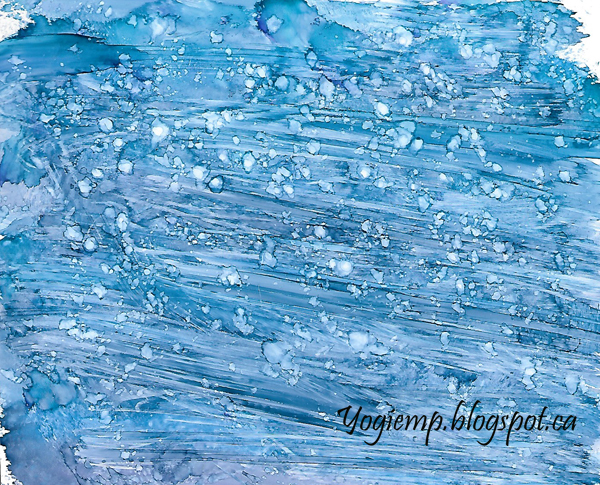 I created the alcohol snowy background on a glossy type paper using and felt tool and inking the felt with a good sized dot each of "Denim", "Stream", "Sailboat Blue" and some blending solution, pouncing and twisting my felt tool to avoid repeat patterns. I then added a bit more blending solution and created a few streaks across the sky. To accent some of the snowflakes I applied a bit of blending solution on my craft sheet and used a fine tipped paint brush, picking up some of the solution and adding to the snowflake dots here and there. I top folded my white card. Trimmed down my sky background and cut a wavy line along the bottom to mimic hilly areas. Adhered to card front. Used an ink blending tool and some Distress "Tumbled Glass" to add shadow lines. (sorry they are pretty light so hard to see...). Die cut the pine trees (Dee's Distinctively) from some Brusho decorated watercolor paper. I had generously misted my paper with water and then sprinkled various greens all over adding a bit of gold powder (Schmincke Dry Metal Powder Rich Pale Gold) and more water, tilting here and there to move the colors. When partially dry, but still quite damp, sprinkled with coarse salt and set aside to dry completely. Then brushed off the salt. 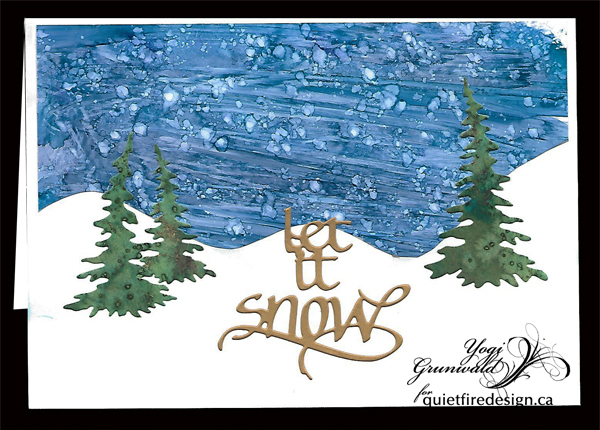 Die cut the "Let It Snow" from a matte gold cardstock. 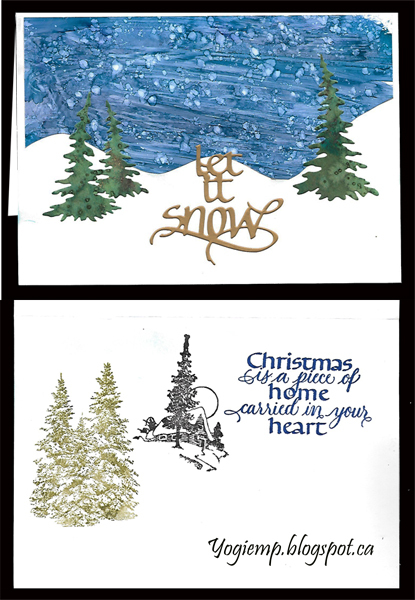 On the Inside: Stamped the pine trees (Deep Red "Winter Pines") using Distress "Forest Moss" and here and there with "Hickory Smoke", clear embossed. Stamped the house scene (Old Island Rubber) with Versafine Black Onyx and clear embossed. Sponged some of the Tumbled Glass through the sky area. 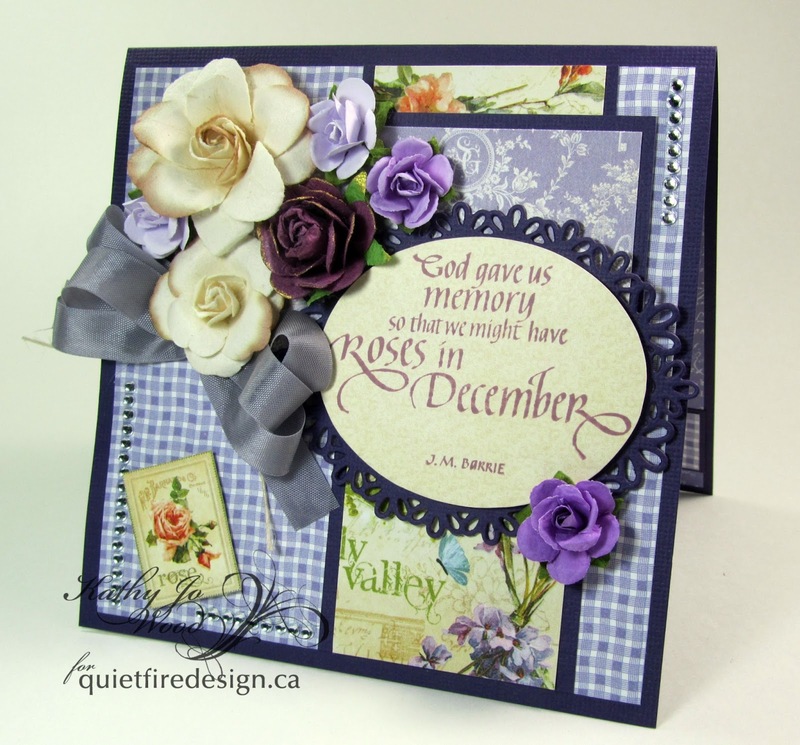 Stamped the quote with Versafine "Majestic Blue" and clear embossed. Are you ready for some Christmas cards? Every year I struggle with sending photocards or handmade cards. This year will be a combination of both! So here is a first of many. I broke out the color bursts for this card. It's a very fast way to get water color backgrounds as well as your own designer sheets to use for die cuts. 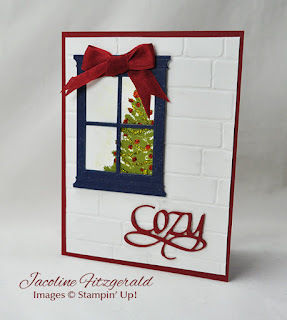 Here I used the Evergreen Wreath and Small Poinsettias by Elizabeth Craft Designs for my floral elements. I love the effect of the color bursts because the ensuing patterns are natural and unexpected. 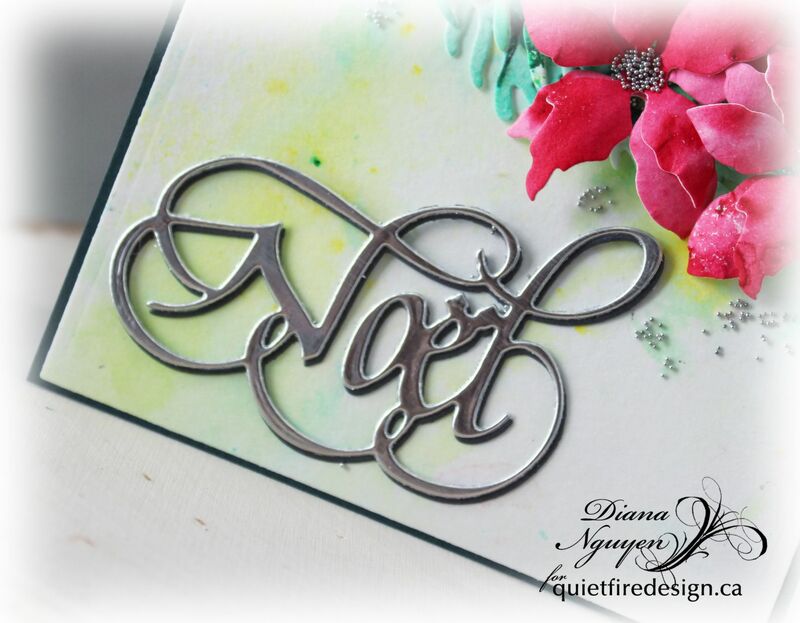 The Noel by Quiefire Design was cut from silver foil and then backed with the same gray cardstock that I used for the card base. I used silver microbeads for the center of the poinsettias. As I was waiting for the glue to dry, I found that I really liked the extra beads on the base layer so I glued those on too! 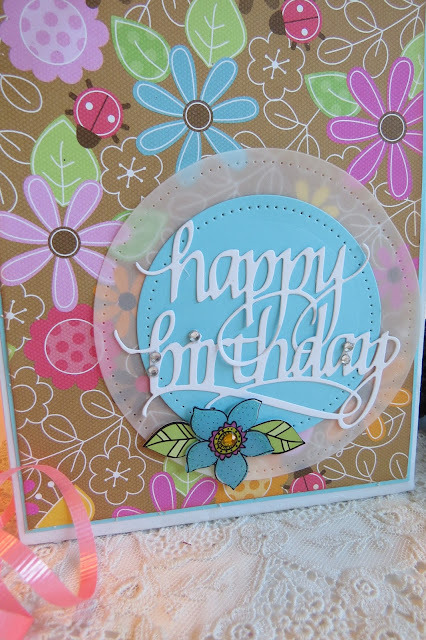 The tent fold card had many layers of Graphic 45 papers (Secret Garden). The paper is from my extra-awesome-favorite-paper pad-stash and I use it sparingly. However, the lovely stamp needed lovely papers so pulled out the treasured pad and cautiously cut the required pieces. The roses were applied at will...it is for the winter so the more the merrier! 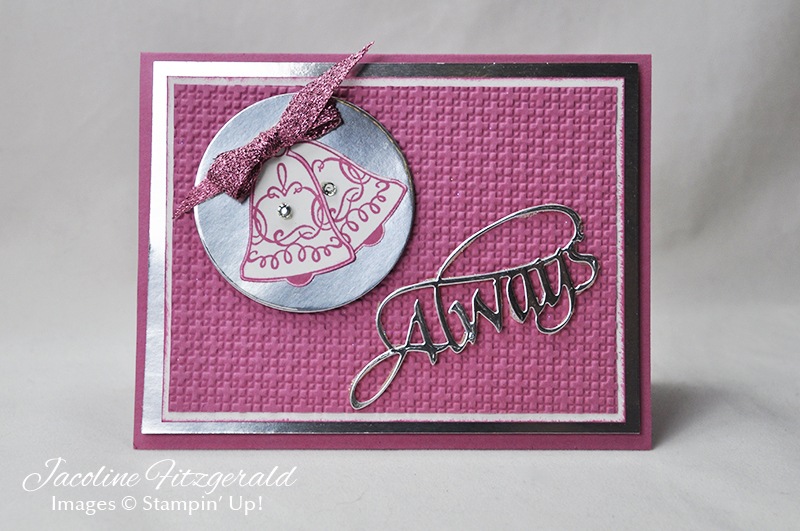 Isn't the stamped sentiment gorgeous? Thanks so much for stopping by! 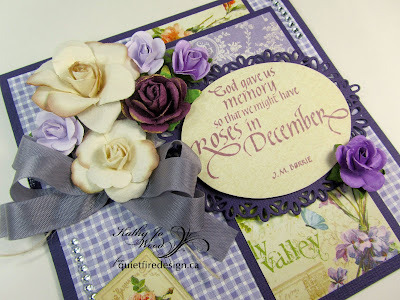 I do hope you enjoyed the card and I hope that every day you have fond memories of roses! 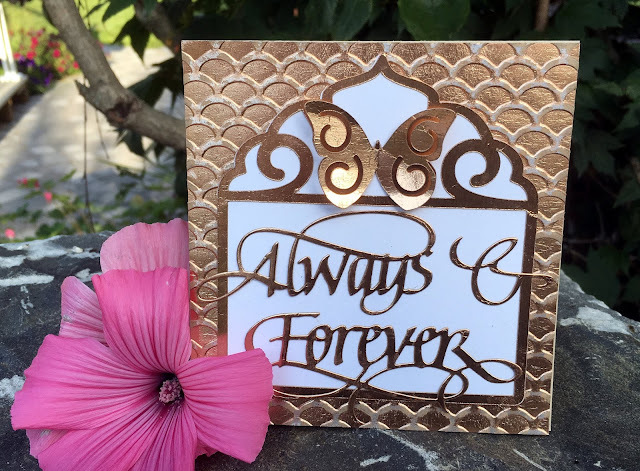 Hello, Connie Nichol here today with some simple cards I created with the Quietfire Design Always and Forever dies from Elizabeth Crafts Designs and a butterfly frame cut using a Quietfire Design digital cut file. 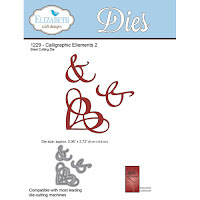 These are the dies I used - Always, Forever, and an ampersand from the Calligraphic Elements 2 set to tie them together. Those calligraphic elements are so handy! 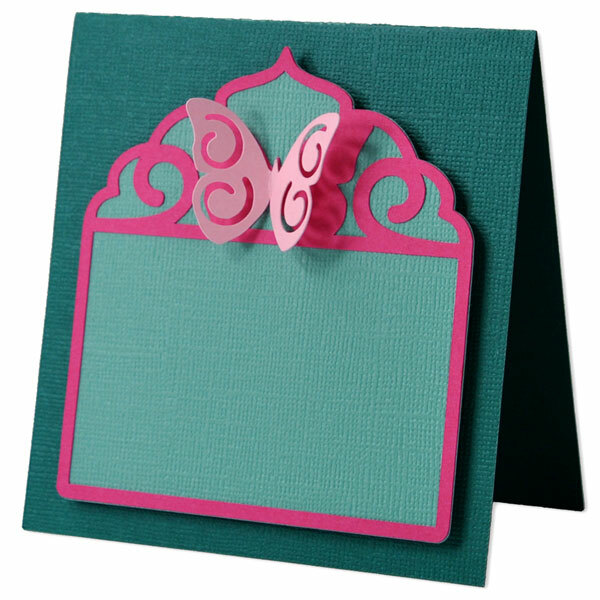 The butterfly frame card digital cutting file is available in the Silhouette Store here. 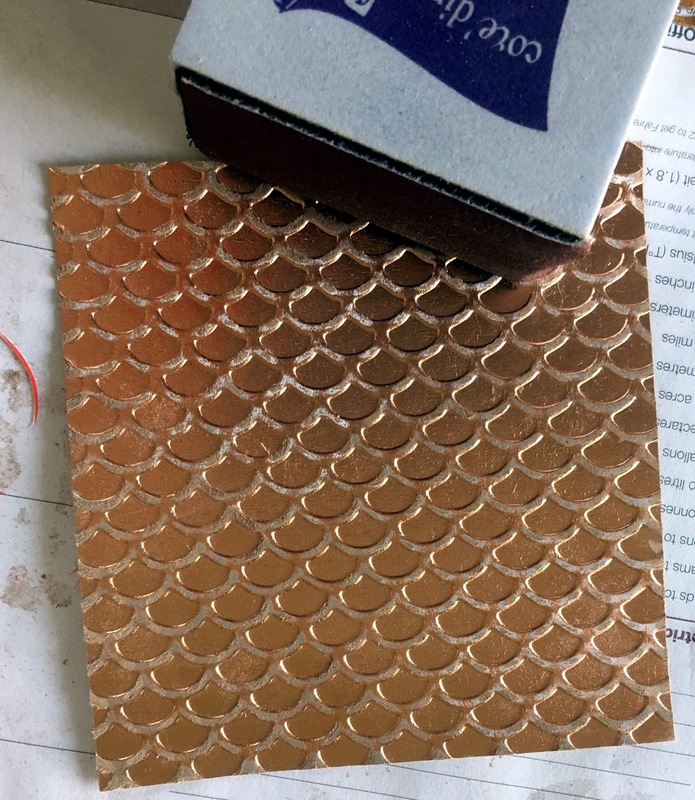 I used paper from the Core'dinations Metallic Collection line. 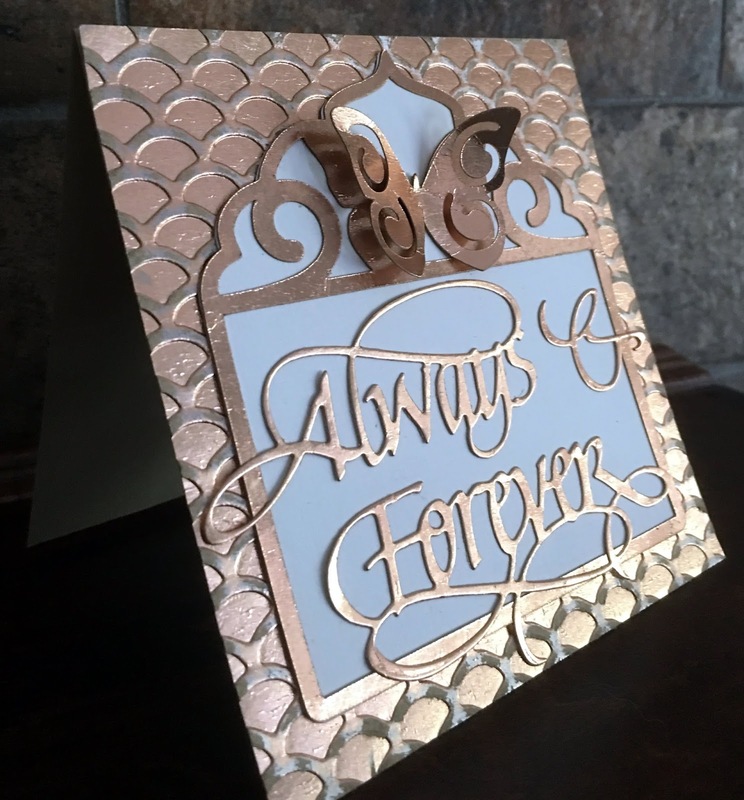 This paper cuts and embosses beautifully and the metal look is very elegant. While I had everything out, I made two more cards just to have on hand. I just used different Way with Words dies, and changed up the embossing folder and paper colour. Once you cut that butterfly frame, it's easy to customize. Obviously, this card used the Quietfire Design Congrats die. And this one turned into a birthday card courtesy of the Happy Birthday die. 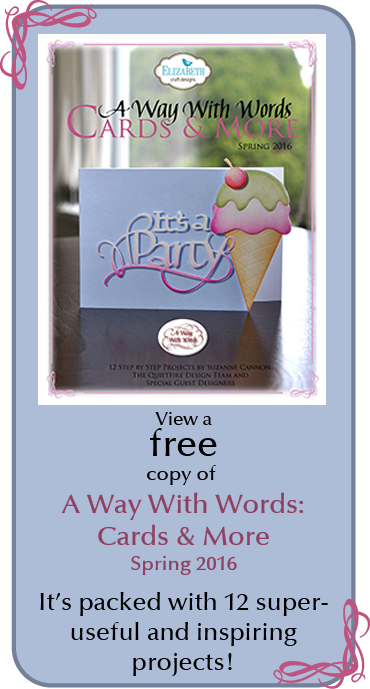 Any of the Way with Words dies will work beautifully and of course, you can resize your butterfly frame card as you like to fit different words or stamps. Thanks for looking and have a crafty day! Hi everyone it's Teresa here on this gorgeous Thursday in California with a post to remind you to always remember the little things in life. 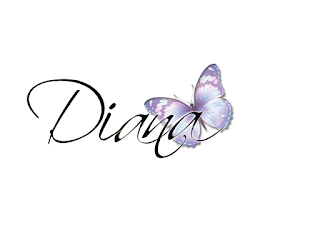 Last week the angels came for my mom and when something tragic happens like that happens in your life you start remembering so many amazing times with that person during their lifetime. It's a good thing to do and making up pretty things to cherish all those memories to remember your family and friends is really special and an even better thing to share with all of them as a gift in some way. This would be a cute cover for a mini book too or maybe even a photo disc to give with pictures that you found tucked away like we did. 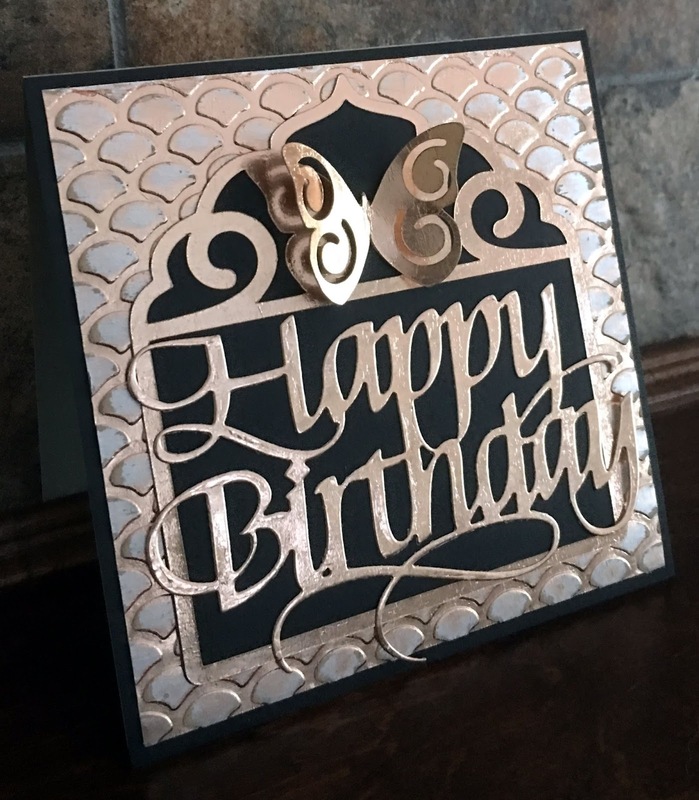 So this card is really simple using just die cut squares created with some papers and things sent to me from a fellow team member Yvonne. We both love to watercolor and little bears so i thought i would make up this card to put in some pictures i found to remember my mom. 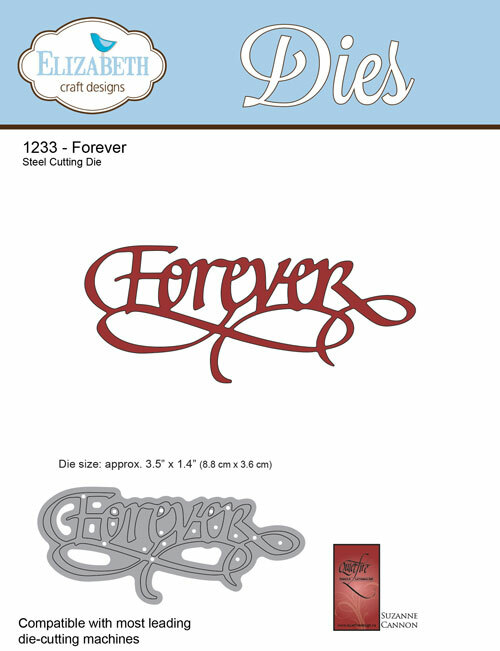 The new "Remember die" was perfect to cut out and put at the bottom of the wood die cut she sent me. 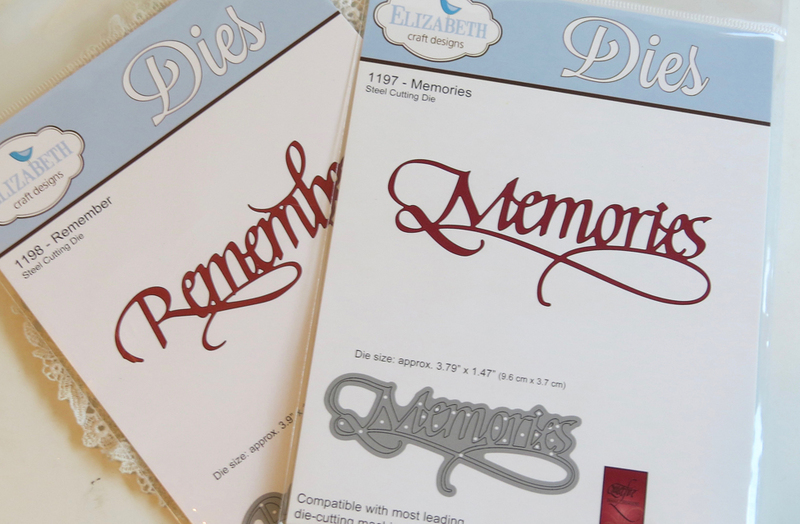 I inked the "Remember" die a little on the top and the bottom to make it stand out and let it sit out on the card to make it more 3D. Just something a little different. And... The bear I colored on watercolor paper with Copic markers and colored it in subtle shades of brown and pink to match with the Maja Design papers. It was quick and easy and i love the colors and my mom would have loved it too. Here is a closeup of the die and the chalking. 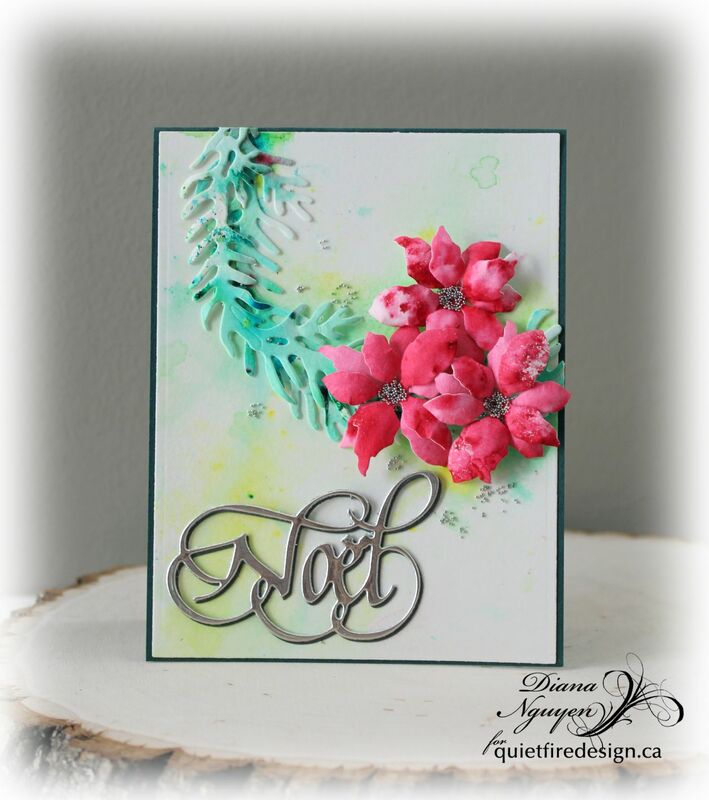 You could even use a couple of different colors together and blend them with a sponge to make a pretty watercolor effect on it. 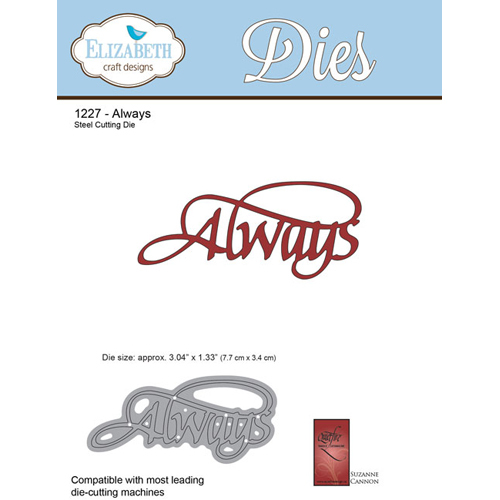 And just to make it more fun with the new release of dies I have 2 dies i would love to give away to 2 lucky readers. Just leave us a comment with your favorite dies you love in this new release and we will pick 2 of you to get the new Remember die or the new Memories die. Both are great for cards and books and would be so handy to have in your stash to use. Who wishes for snow more than anyone -- snowmen of course! This is Selma today with a fun card using Suzanne's new A Way With Words Let It Snow die set. This is a 6x6 inch card. 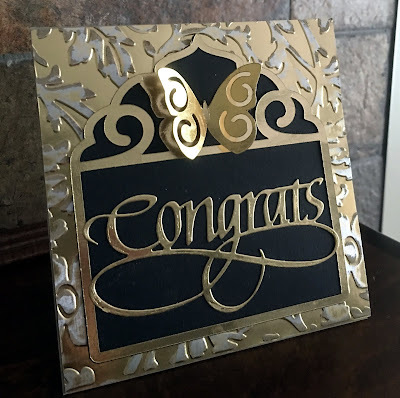 A piece of design paper was used at the top half of the card. White card stock was cut to resemble snow banks for the bottom. 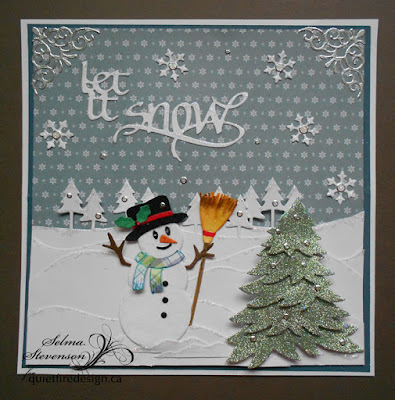 The happy snowman was die cut using Joset Designs Snowman from Elizabeth Craft Designs. The green dimensional tree was die cut using Els van de Burgt Studio 5-Part Pine die set. A piece of white card stock was covered with Clear Double Sided Adhesive and the tree pieces die cut. Silk Microfine Sea Glass Glitter was used on the adhesive for a beautiful sparkly tree. 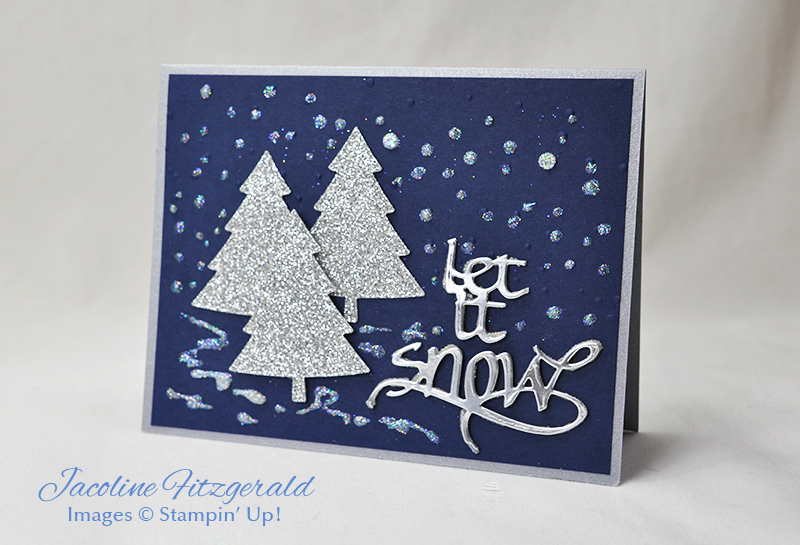 Silver dot stickers were attach to the tree and a few on the blue design paper. Silver Peel Off Sticker Corners were added at the top. 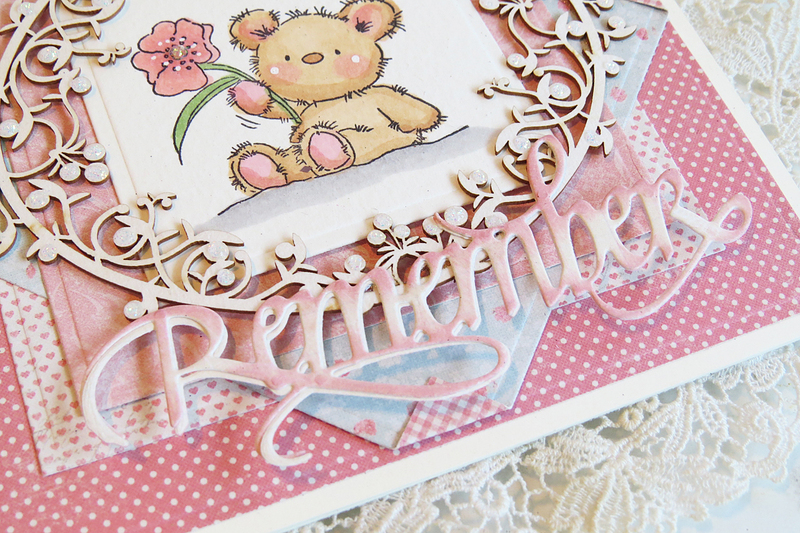 Would this card make you smile if you received it?